Take a look at this photojournal that "humanize[s] the face of cancer on the face of [the photographer's] wife." 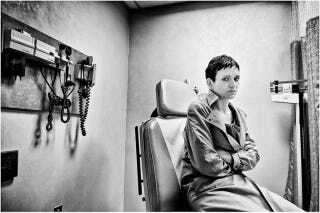 After Jennifer Merendino was diagnosed with breast cancer, her husband Angelo decided to document what cancer patients must endure. In the midst of the inane "save the boobies" propaganda with which we've been bombarded this month, this is a poignantly stark reminder of the effects cancer has on the women themselves and those who love them. This really hits hard; these pictures are agonizing not only because of the physical toll breast cancer (and other cancers and illnesses) demands, but because there's a lot of love evident in these scenes as well.